Hydrochloric acid, or muriatic acid, is a pungent liquid with highly corrosive properties. As a result, specialized storage solutions are required to insure safety. 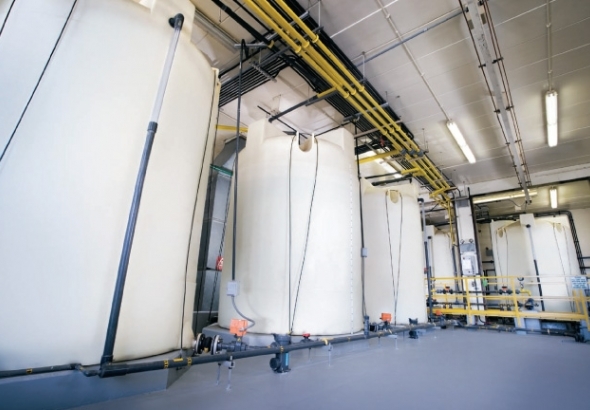 Let’s explore the storage challenges and solutions for hydrochloric acid. Hydrochloric acid is highly corrosive since it has an extremely low pH. Hydrochloric acid generates toxic fumes that can be harmful or fatal to employees and damage equipment. The toxic fumes generated from present a tank maintenance issue. Entering the tank for cleaning must be avoided at all costs and parts replacement minimized. A strong, corrosive -resistant tank with a scrubber system that handles the fumes is required to safely store hydrochloric acid. The proper tank, fittings, and venting are needed. An Integrally Molded Flanged Outlet, or IMFO®, allows for complete drainage of the tank. This eliminates the need to enter the tank for cleaning. When dealing with such a strongly fuming chemical such as hydrochloric acid this is essential. Also, since the drainage system is part of the tank mold design, replacement parts for the tank are minimized. In addition Poly Processing’s OR-1000™ system is ideal for HCl storage. It addresses the aggressive oxidizing and corrosive nature of hydrochloric acid. NSF 61 certification, fume tight lids, scrubber systems, and proper venting design round out the storage system design for safe storage of hydrochloric acid. For more information, please download the Hydrochloric Acid Storage Guide.